SUMNER, Charles (1811-1874) was an American politician and United States Senator from Massachusetts. As an academic lawyer and a powerful orator, Sumner was the leader of the anti-slavery forces in Massachusetts and a leader of the Radical Republicans in the U.S. Senate during the American Civil War. He worked hard to destroy the Confederacy, free all the slaves, and keep on good terms with Europe. During Reconstruction, he fought to minimize the power of the ex-Confederates and guarantee equal rights to the freedmen. 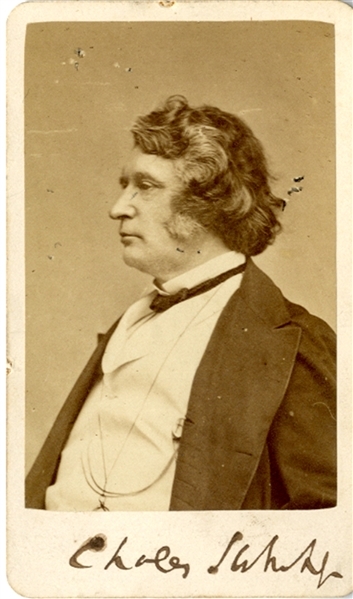 Signed Carte de visite of Charles Sumner “Charles Sumner.” no backmark. Fine condition.